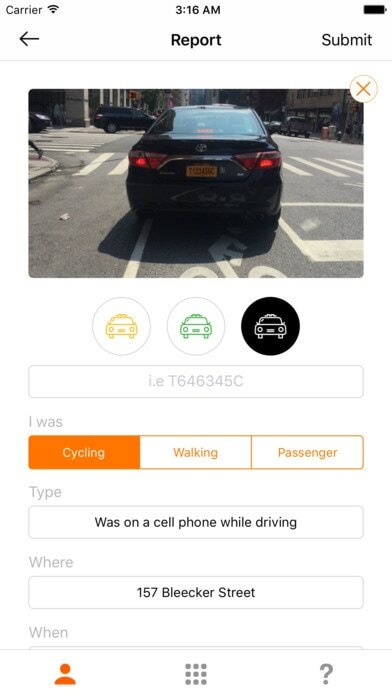 Reported lets you hold NYC drivers accountable for dangerous driving, via 311 & more. ﻿If you've ever taken an Uber, Lyft, or other app-enabled ride, you probably noticed a rating system at the end of your trip where you can give some feedback on your driver. This gives drivers the feedback they need to improve and understand their passengers. Reported is an iOS that lets you submit feedback about taxis in 30 seconds. We aim to be the Uber ratings for the 175 million NYC yellow taxi trips each year. Reported submits this feedback directly to 311 and the Taxi and Limousine Commission, so your complaints and compliments will be taken seriously and acted upon by city officials.